I also have a “severely autistic” nephew. Michael is his name, and he is now out of school and hoping to find work. Interesting soul is he. Another nephew is diagnosed as Asperger‘s. Brilliant kid, he could fly a 767 flight simulator at 5 years old. Perfectly. For days at a time. What does this have to do with brainstorming? Because sometimes the storm going on inside our brains — the one we think of as confusion, frustration, panic, pain, horror, fear — often that brainstorm is the key to breakthroughs. Glad you watched. Now, before we jump into conformity-based idea generation, maybe we ought to think in a different language… one that touches, smells, tastes, sees, senses things from a completely new perspective. Language takes many forms. I encourage you to visit the YouTube channel above and see the comments made by the author. Proof that our basic aural+written language suffers serious limitations in comparison to someone who feels language from all senses. The image above is one from one of my very favorite communicators. 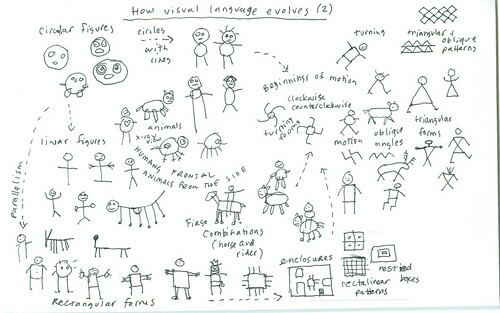 This is how he visually organizes his interpretation of a presentation on the origins of language. Look carefully. What he’s done here is so much more than a mindmap. In fact, I’d put it in another class altogether. This requires little to no explanation. Each element is easy to understand. How it leads to the next element is obvious. An example of visual communication at its finest. P.S. Thanks to Dave Gray of XPLANE for the image we’ve shared above. To see the whole source image, CLICK HERE. It’s pretty, cool, effective and amazing.